Researchers at MIT have come up with a low-cost system that can produce electricity and hot water or steam simultaneously using the energy of the sun. Their design is based on a conventional solar thermal system but incorporates special features that make it more efficient and flexible. As the world looks for new ways to fulfill its appetite for energy, there are many technologies that can produce either heat or electricity using the energy of the sun. For example, in many parts of the world, people get warm water for their homes from systems in which sunshine heats up water inside a glass tube or black tank. Such systems are simple and inexpensive, but in that configuration they provide only warm water, no electricity. For electricity production, much interest is focusing on thermoelectric (TE) devices. When a TE device is hotter on one side than the other, it generates electricity -- no combustion and no moving parts involved. But until recently, solar-driven electricity-generating systems using TE materials have not proved very efficient. 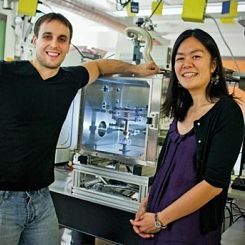 Now Evelyn Wang, associate professor of mechanical engineering and director of the MIT Device Research Laboratory, and Nenad Miljkovic, graduate student in mechanical engineering, have designed a hybrid system that brings those two approaches together to produce electricity and hot water or steam at the same time, pushing up both the temperature of the water and the efficiency of the overall system. Their system is based on a standard solar energy collector called a parabolic trough. In this type of device, a long parabolic mirror reflects sunlight onto a fluid-filled tube that runs its length at its focal point. A mechanical pump moves the heated working fluid through the tube to the point of consumption. There, it can be used directly for space heating or for running industrial processes, or it can be used to produce steam to drive an electricity-generating turbine. "All of our projects focus on efficiently transferring heat and mass in various types of systems," Wang says. And what is unusual, notes Miljkovic, is that they incorporate surface science into their work. For example, one project looks at how to structure surfaces to make the phase change process itself -- the vaporisation and condensation -- more efficient. "So within the design of our thermosyphon, we can actually introduce structuring of the surfaces to further enhance efficiency," says Wang. By drawing on results from that and other projects, they will be able to continue improving the performance of their novel hybrid solar-thermoelectric system. Your blog posts are poppin! Anesthesia : Contributing to pollution? Solar Energy Directly Into Steam!